Creating beautiful table decor and planning parties is one of my passions. I thrive on designing all the little and big details, but especially the personal details. and can really help a couple connect and reconnect. It is the "Season of Love," but everyday can be a special occasion. There are different ways to create a seductive table and bring a little romance into your daily routine. You do not need to plan a whole production - what is most important is that you do what feels right for you - what fits into your life, your budget, and marries well with your personality. and still for others hot dog and a soda at a ball park. There is no wrong answer when it comes to creating couple time, just create the time. Have you thought about creating a "moment" for you and your special someone? 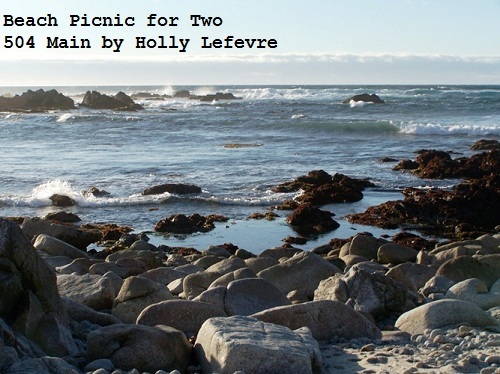 This book inspired me to create a wonderful Beach Picnic for myself and my husband. 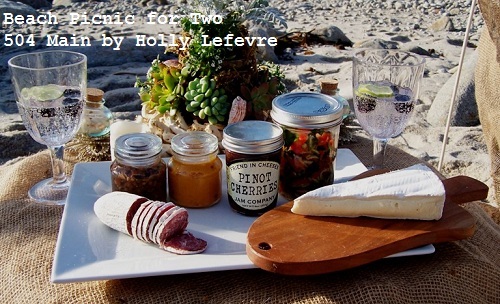 Whether you have, or you are just starting to think about it, Seductive Tables for Two: Tablescapes, Picnics, and Recipes that Inspire Romance by Moll Anderson is here to provide guidance and inspiration. I am kind of obsessed with books on design, table decor, and celebrations, so when I was shopping online (you can read all about my shopping trip on google+), I saw Moll's book and was immediately interested in reading about her philosophy for creating a Seductive Table for Two. The book has a little something for everyone. 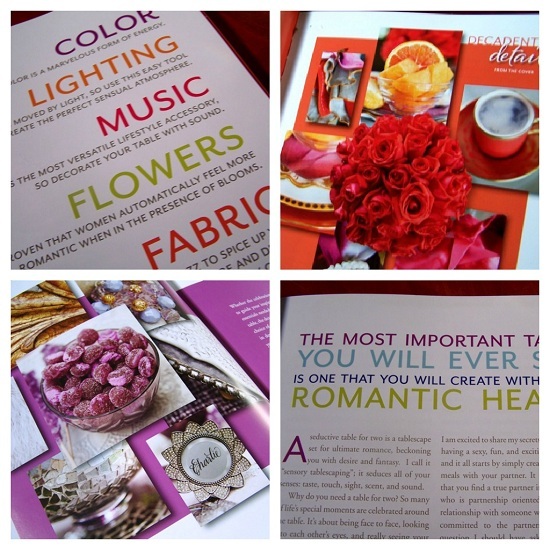 Moll is a lifestyle and romance expert who has created this amazing book full of recipes and tips and advice, not to mention gorgeous photographs of a variety of themes and ideas for creating your own special celebration. 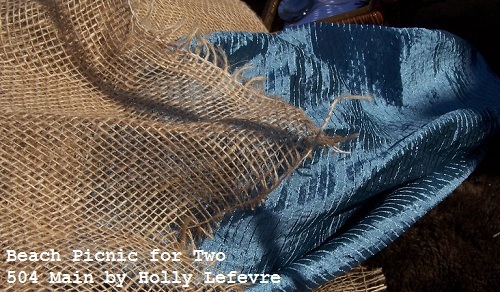 Moll's essential elements for creating a Seductive Table for Two include: color, lighting, music, flowers, and fabric. These elements work together to create a beautiful, memorable experience to share with someone you love. From creating "Seduction To Go" to "Seductive Celebrations" you can easily find inspiration for creating romance and #SeductiveTables in the pages of Moll's book. I began to formulate my own plan for creating a seductive table for two. if just for an hour or two, just the two of us. (that is a wee bit of an exaggeration). and how sad of a world that would be! I happen to live on one of the most gorgeous coastal areas in California - Asilomar State Beach. We love exploring the Central California shore, and there is something about watching the sunlight dance on the water, and listening to the waves crash that puts life in perspective. That is why I chose this to be the inspiration and backdrop for my seductive table. 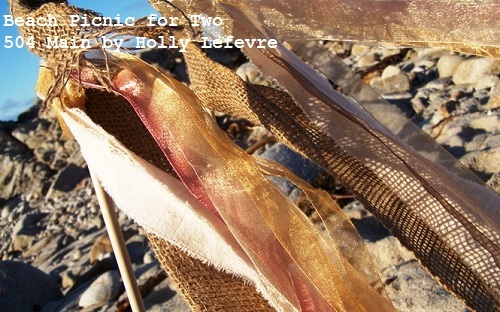 Planning an event, even for just two of us on the beach - or anywhere that you have to transport everything from food to decor to music - takes planning and thought...and preparation. But it is worth the effort. I tried not to let the beach location define the table or the menu - that is way too matchy-matchy for me. I like to let the locale speak for itself and let the other elements accent and enhance the experience. I wanted a romantic and slightly rustic look, with a hint of glam. I LOVE textures - combining textures and layering, not only with fabric, but with plants and other design elements as well. It makes my heart go pitter-patter. I like to mix things up - rustic and glam, sweet and spicy, rough and silky - in my world, whatever goes! I knew this would be an essential part of my design. I laid down a faux fur throw for us to sit on and then topped it with a low table. I hate sand in my food, so I brought down one of those inexpensive decorator table (I had previously cut the legs down) to set our food and beverages on. you sometimes have you go with the flow! I did not intend for the burlap to be the top layer of the table. I had this gorgeous sea blue fabric...but it was so windy - so windy and the blue fabric was flying everywhere, whereas the weight of the burlap held steady. So, I flipped it. Normally I would not want burlap on top, but the table was small, the platter I served on was large, and well, it worked. A mix of succulents and fresh plants were my centerpiece. I mixed them all up and used a silver champagne flute to plant the centerpiece. It was encircled at the base with a "driftwood" wreath I already had. Then I tucked succulents into the crevices, and added a few seashells here and there. On either side I used a glittering flower (Christmas decor) and set a small bottle of sea glass atop each flower. As for candles...in my perfect world there would be 100 candles - but I wanted to enjoy my time and I would have spent every minute relighting candles. I picked up some LED candles, wrapped them with a pretty ribbon and pinned a vintage earring on them. I did have some additional LED candles but as luck would have it...it had been overcast and gloomy for days...the sun burst out from behind the cloud...so you could not even see the candles glowing...just imagine them ok? I put up some flowing ribbons. it was the perfect time of the day to do this. I decided that our food would be cold selections. 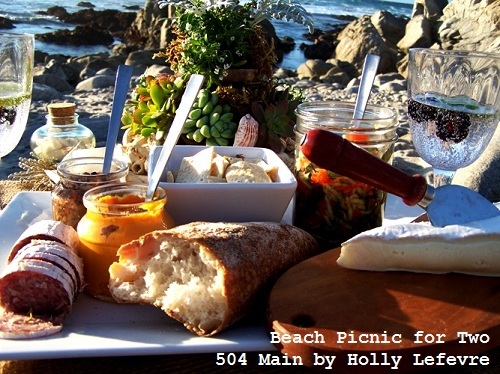 It would be much easier and enjoyable to navigate a beach picnic - I packed it all in our vintage cooler, picked up a fresh baguette from the local bakery, and we were ready to go. and keep the pesky seagulls away! Lentil Chips and a baguette would be served with all of the selections. 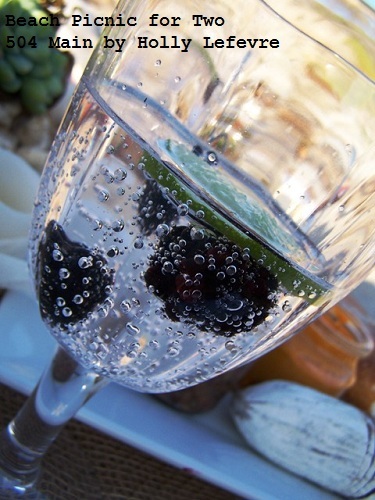 so I selected sparkling water garnished with blackberries and lime. I chose not to do individual plates. I packed up the dips in jars, brought a cutting board, a few small bowls, and my favorite large white platter. I happened to like the informal, eclectic look of this service. I did bring cloth napkins and real flatware. Are you ready to create a Seductive Table for Two? As you can see my table was relatively simple and just perfect for us. What would your seductive table look like? Love this book? Want to hear more of what Moll has to say and share? is on XM Talk 168 every Saturday at 5:00 pm EST. 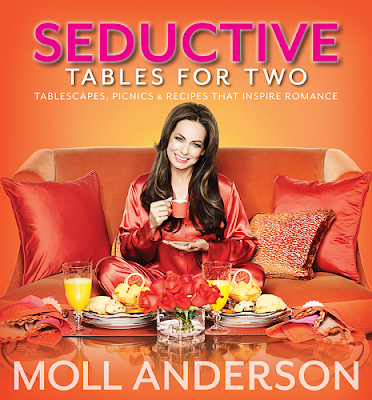 Seductive Tables author MollAnderson on AccessHollywood tomorrow! Times: http://cbi.as/5dok0 - don't miss it! 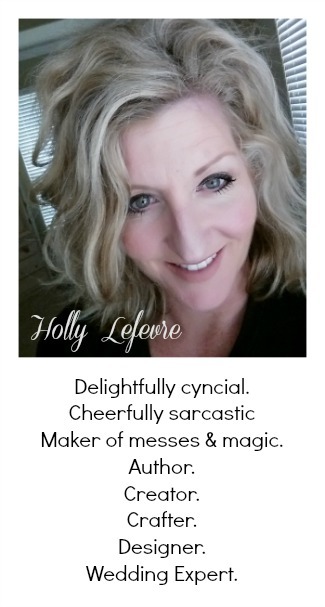 You can also connect with Moll on twitter, Moll on Facebook, and on Moll's website. Wow Holly, it turned out so beautifully! 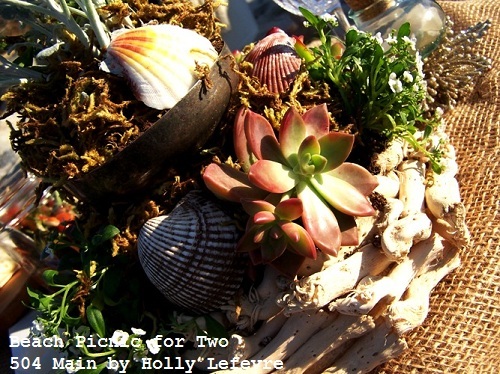 I love the succulent and seashell centerpiece! Oh my goodness Holly! It is so beautiful and I am so jealous that you live by the ocean! Living in Minnesota, I am way to far from the beach! 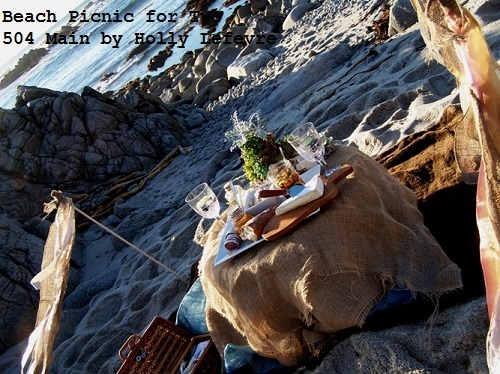 What a gorgeous backdrop the beach, rocks and waves made for your stunning picnic table setting! I loved all of your special touches, especially the pretty garnishes in the sparkling water and the flowing ribbons on the dowels. I bet your husband loved it! Wow, you did an amazing job! What a beautiful setting! Mol would be thrilled to see this! I love all of the touches!!! 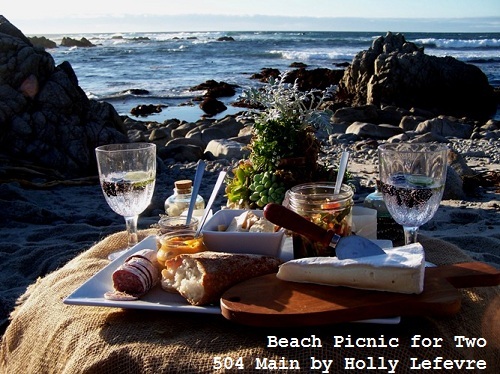 I am so jealous you could do your tablescape at the beach! Everything turned out beautiful! Look at you fancy lady!! Love it!!! I love this whole post. Incredibly beautiful! I want to pull up a chair... looks like a fantasy meal brought to life! How romantic!! 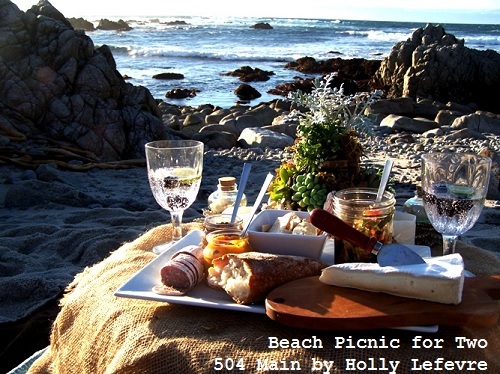 What a perfect date--I need to work on planning a picnic like this! Holly, that is stunning. What a beautiful location and a beautiful table! You go girl! This is absolutely gorgeous and no detail was left out at all. Lovely!! Okay I'm SO jealous of your local! I LOVE Carmel and Monterey. 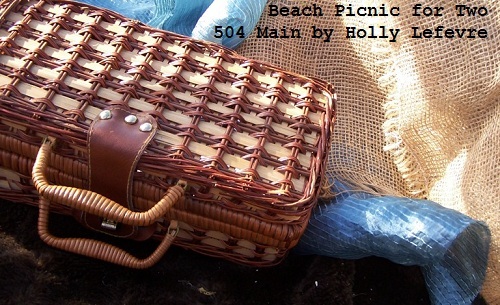 Your picnic is so pretty! What a beautiful setting and a lovely romantic tablescape! Wow! Stunning table and setting. Absolutely love it! Holly, such a sweet idea! I have an anniversary Sunday. Thanks for the inspiration! This really made me wish I lived by the beach. Love it! Wow! 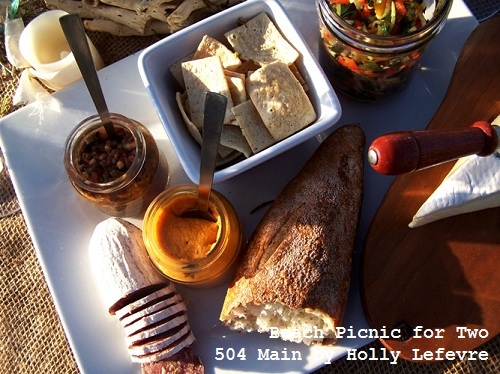 What a lot of time and effort you put into this wonderful picnic. Love it. This is mt first visit but I can see that U rocks. This ambiance reminds me of our beach dinner for 2, in The Philippines. So romanticbut with a -20 deg? hmmm... will wait until Summer. That is so beautiful! I love the idea to transport food in mason jars. What an unbelievably beautiful post - all of it - makes me want to be there like you can't believe!!! Oh my goodness! This is incredibly Holly! Lucky you living where you do! What a perfect birthday celebration!